The Novotel Brussels Off Grand Place is located right in the centre of Brussels, moments away from what is said to be the most beautiful town square in the world. Within easy reach of Central Station, this 138 room hotel combines comfort and innovation.T. he lobby and the Foodsquare bar brasserie share a warm and bright open space, a celebration of chic design. 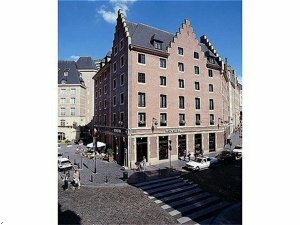 This 4 star hotel welcomes you in this historic area of Brussels for a weekend or short break with your partner or family. On the ring, take the E40 to Bruxelles-Liege and follow signs Bruxelles-Brussel. In Brussels,take the tunnel and follow signs Centre. At a roundabout Schuman take the 2nd street on the right and follows signs Centre.You will merge into Rue de la loi-Wetstraat. At the 4th traffic light,you will get on a large intersection . Cross this one.At the 4th traffic light turn to the right.Under the church,turn left at the traffic light and turn right at the next into Rue de la Montagne.You see the hotel on left.